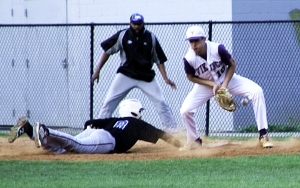 Stephenson’s Ga’von Wray dives back into first against Lakeside. Wray was recently named to the .400 Club All-Metro Team. Ten years ago DeKalb County Athletics revamped its All-Star Baseball format moving from two senior games to one junior and one senior to allow both upper classes the opportunity to perform in front of fans and scouts to close out the school year. The 10th edition of the DCSD Junior All-Star Baseball Classic gets underway at 4:00 pm on Tuesday, May 29 at Stephenson High School as 30 of the top juniors from the school district face off for bragging rights heading into their senior season. The West leads the current series (2013 to present) 3-2, but the East pulled closer with a big 12-4 victory last year. Coach Alexander Wyche of Redan heads the East All-Stars coaching staff and is assisted by Stephenson’s Marco Jackson. They hope to lead their team to a series tying win. The East squad has three members with 20 or more RBI set to participate led by Tucker’s Miles Bowen (.370, 27 RBI) who lead the county with eight homeruns this season. Joining Bowens are Tucker teammates Jordan West (.304. 20 RBI) and Christian Webb (.388, 21 RBI). Arabia Mountain’s Micah Sanders (.418, 19 RBI), Theo Bryant (.350, 17 RBI, 3 triples) of Southwest DeKalb, Justin Jordan (.344, 14 RBI) of Arabia Mountain and Southwest DeKalb’s Chauncey Adams (14 RBI) also add some fire power to the lineup. Southwest DeKalb’s Kendrick Scott (.355, 12 RBI, 2 doubles) gives the team a top threat on the base paths as he finished the year with 35 stolen bases. Stephenson’s Ga’Von Wray should lead the way on the mound after finished the season as the earned run average leader for DeKalb with a gaudy 0.79 average, an 8-2 record and 94 strikeouts in 61 2/3s innings. Chamblee’s Brian Ely whose team won a school record 25 games this season heads up the West squad with the assistance of Lakeside’s Donnie Hayes as the West tries to hold on to the series lead. A pair of Top 10 DeKalb batting average leaders in Cedar Grove’s Tremaine Hill (.460, 5th) and Chamblee’s Matthew Welsh (.443, 24 RBI, 8 doubles) who is third in runs scored for DeKalb. Chamblee’s Max Stephens (.337, 22 RBI, 5 doubles) and Travis Hammond (.289, 18 RBI) who scored a DeKalb second best 43 runs this spring played big roles in the Bulldogs’ record setting season. Add Columbia’s Dominique Humes (.315, 14 RBI, 6 doubles), Druid Hills’ Ali Desrochers (.302, 12 RBI) and Lakeside’s Gus Young (.350, 8 doubles) to the mix and the West also has a formidable lineup. Stephenson (8-2, 3.76 ERA, 43 Ks, 48 1/3 IP) and Dunwoody’s Jack Caiaccio (5-6, 2.86 ERA, 42 Ks, 56 ½ IP) help solidify the pitching staff. The game is set as a doubleheader with the 16th Annual Senior All-Star Baseball Classic (7:00 pm). The possibility of rain on Tuesday has a tentative makeup date of Tuesday, June 5 at 4:00 and 7:00 pm at Stephenson High School.